For other uses, see Mew (disambiguation). Not to be confused with Muse. 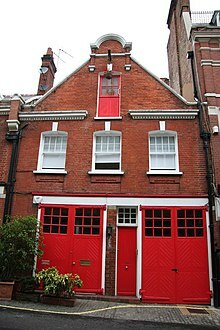 Mews is a British name for a row or courtyard of stables and carriage houses with living quarters above them, built behind large city houses before motor vehicles replaced horses in the early twentieth century. Mews are usually located in desirable residential areas having been built to cater for the horses, coachmen and stable-servants of prosperous residents. The renovated servants quarters provide attractive housing in the best locations with off-street parking in the carriage house and stable. The word mews comes from the Royal Mews, royal stables built 500 years ago on a former royal hawk mews. It is now commonly used in English-speaking countries for city housing of a similar design. Mews derives from the French muer, "to moult", reflecting its original function to confine hawks while they moulted. Shakespeare deploys to mew up to mean confine, coop up, or shut up in The Taming of the Shrew: "What, will you mew her up, Signor Baptista?" and also Richard III: "This day should Clarence closely be mewed up". From 1377 onwards the king's falconry birds were kept in the King's Mews at Charing Cross. The first recorded use meaning stables is dated 1548 after the royal stables were built at Charing Cross on the site of the royal hawk mews. Those royal stables moved to Buckingham Palace Road in 1820. There were also royal mews at St James's Palace. The name mews was taken up for domestic stables in the city during the 17th century. The 18th century Washington Mews in Greenwich Village, New York City matches the London buildings in period purpose and name. Mews has since been transferred to any stable buildings in any space, lane, alley or back street onto which these buildings open. And to any new residential buildings of similar character throughout the English-speaking world with motor vehicles taking the place of horses and carriages. Mews was applied to service streets and the stables in them in cities, primarily London. In the 18th and 19th centuries London housing for wealthy people generally consisted of streets of large terraced houses with stables at the back, which opened onto a small service street. The mews had horse stalls and a carriage house on the ground floor, and stable servants' living accommodation above. Generally this was mirrored by another row of stables on the opposite side of the service street, backing onto another row of terraced houses facing outward into the next street. Sometimes there were variations such as small courtyards. Most mews are named after one of the principal streets which they back onto. Most but not all have the word "mews" in their name. This arrangement was different from most of Continental Europe, where the stables in wealthy urban residences were usually off a front or central courtyard. The advantage of the British system was that it hid the sounds and smells of the stables away from the family when they were not using the horses. Mews is not used for large individual non-royal British stable blocks, a feature of country houses. For example, the grand stable block at Chatsworth House is referred to as the stables, not the mews. Mews lost their equestrian function in the early 20th century when motor cars were introduced. At the same time, after World War I and especially after World War II, the number of people who could afford to live in the type of houses which had a mews attached fell sharply. 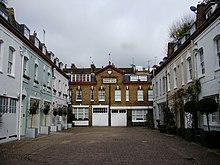 One place where a mews may still be found put to equestrian use is Bathurst Mews in Westminster, near Hyde Park, London, where several private horses are kept. Nearby, the mews' stables have been put to commercial use. Some mews were demolished or put to commercial use, but the majority were converted into homes. Contemporary movements to revitalize and creatively re-use historical and traditional features of urban environments have also cast some appreciative light on mews. A contemporary presentation of the some 500 former horse stables in the city of London appears in the book The Mews of London: A Guide to the Hidden Byways of London's Past. In the Smart Growth, Traditional Neighborhood Development and New Urbanism movements, the term is used frequently, but definitions of the term are rare. The East Village Redevelopment Plan for Calgary, Alberta, Canada, explains that "Mews are narrow, intimate streets that balance the access and service functions of a lane with active building frontages, accessory uses, and a street space shared by cars and pedestrians." ^ About a Mews Everchanging Mews. ^ Grant, Jill (2006). Planning the Good Community: New Urbanism in Theory and Practice. New York: Routledge. p. 63. ISBN 9780415700757. ^ "Athena Medals". Congress for the New Urbanism. Archived from the original on 28 September 2013. Retrieved 14 January 2014. ^ East Village Area Redevelopment Plan (PDF). City of Calgary Planning, Development & Assessment Department. 2010. p. 39. ^ Steuteville, Robert. New Urbanism Best Practices Guide, Fourth Edition. New Urban News Publications. p. 71. Look up mews in Wiktionary, the free dictionary. Part of Belgravia in London – There are numerous mews on this map of Belgravia. Belgrave Square has mews on each of its four sides, although one of them is called Montrose Place. Illustrative explanation of Mews as a contemporary street type: East Village Area Redevelopment Plan, see pages 39–40. 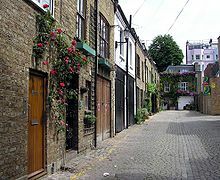 Everchanging Mews - Survey and List of all London Mews.